Learning about DNA has been a tough business and I am very slow at it at this time. I am trying to learn more. In 2013, I did an autosomal test with 23&ME and uploaded that to Family Tree DNA. Then I took a mtDNA test and those results are in. mtDNA goes up your mother’s line to her mother’s mother etc. 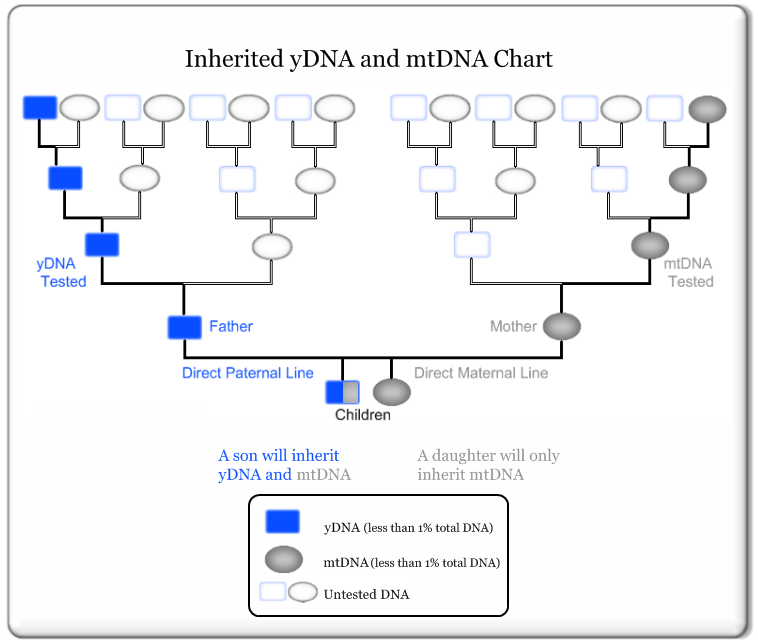 The chart below shows the yDNA up the left side which is the son to father line. This would be my Mac/McDonald line, my father’s family. This usually follows the surname of that line and is easier to trace. mtDNA follows daughter to mother to mother…up the right side of the chart. This would be my mother’s line which is Boardman to Brown to Ward. The stuff in the middle is the autosomal. My mtDNA Haplogroup is H3k1a. I did their full mtDNA sequence in March 2014. I keep getting emails that I have new matches. I also did their Family Finder (autosomal) in November of 2013. They give my Ancestry as 73% British Isles, 17% Western and Central Europe and 10% South Europe. DNA should also be supported by actual genealogical research in vital records and more. The cute TV ad by Ancestry DNA with the man who thinks he is German but finds out he is Scottish using DNA is a little simplified. Beside Ancestry has only an autosomal DNA test which is all the stuff in between the yDNA and the mtDNA. In December 2014, I decided to take the Ancestry DNA test. My understanding is that it has the largest database for DNA so it will be interesting to see what happens. Ancestry’s test does give you matches and percentages of your ethnicity. I am 64% Great Britain, 22 percent Ireland and 7% Europe West. Ancestry only does autosomal testing. A sibling agreed to take the Family Finder test (autosomal) and a yDNA test at FTDNA. The Family Finder is what we will use to compare the two of us. We are close. This is with Family Tree DNA. Family Tree DNA has all types of DNA tests and they also have DNA project. They usually require yDNA testing and the surname to follow the male line. Males only have yDNA, they also have mtDNA from their mothers but they cannot pass it on. I am interested in the Clan Barclay project. I signed up both my sibling and cousin on the McD side for this project. Here is the link to 23&Me. They have my Ancestry composition for me as 99.6 European. 74.6% British and Irish, 8.5% French & German, .09% Scandinavian, .1% Finish. With .3% Iberian etc. They have placed me in the H Haplogroup which is a female Haplogroup not male which is separate. Meanwhile I have been reading through Kelly Wheaton’s online course “Beginners Guide to Genetic Genealogy.” It is very good and free. I also have started reading the book: The Family Tree Guide to DNA Testing and Genetic Genealogy, by Blaine T. Bettinger. It is very good. It is also $29.95 but maybe you can get a deal on it online. There are other companies that provide DNA testing and you can study them as well. There are also 3rd party websites like Gedmatch and YSearch that let you upload to them for further matching options. I am still learning and will let you know. I don’t have the Barclay surname but I do know cousins that do. Fortunately my Barclay cousins have consented to do DNA tests with Family Tree DNA. One is a male Barclay cousin with the surname. The other is his sister and they are together on the Family Finder test. This male cousin descends from John Barclay who is the father of my George Angus Barclay the subject of this blog. The lineage is John Barclay 1801 to 1897, to his son John Barclay b. 1836? and died unknown something about 1870-1880, probably in San Francisco. He is George’s older brother. John’s son John Avery Barclay 1867 Minnesota to 1951 in Seattle, WA, had a son Edward Avery Barclay 1896 to 1937 California, and his son Edward Avery Barclay 1925 to 1970 to his son that did the DNA test. His Haplogroup is I-P37 His Ethnic Makeup for his Family Finder is British Isles 84%, Southeast Europe 15% and nothing else of significance. Now the DNA test I took at Ancestry has connected me to other Barclay cousins that are using the Carter name. This means they are descendants of Anna Barclay Carter a younger half-sister of George Barclay. I have talked with a wife of one of them. What I am looking for is the ethnicity of the Barclay’s so that I can compare it. In response to your Marengo Iowa research into the Blacketer family, particularly Henry B. Blacketer. I am descended from Henry B. and his wife Mary”Polly” Rush ( born tennesee 1822). Henry volunteered in the 28th Iowa infantry, likely fought at Vicksburg, and died 17 June 1863 of apoplexy. He is buried in the National Cemetery there. Sadly,both of Henry and Polly’s sons(James, not Jarvis as you cite, and Thomas J. were in the same regiment and died of disease. James died 28 Aug 1863 and Thomas died May 19 1864 of typhoid fever. Both of them rest at the National Cemetary at Chalmette Louisiana. Their survivors: Polly and daughter Sarah J. who was about11 yrs old. The probate document you mention is a guardian bond for the “orphan” Sara J Blacketer listing her mother as guardian. This was executed after Mary ‘Polly” married a local widower named Daniel Cripe in 1865. I suppose to pass on her interest in her fathers estate to her . The value of the bond was $600. This is who Mary Cripe is. it is Henry Blacketer’s widow. Sarah received the money and released her mother as guardian when she married my 2nd great grandfather John Moore of Marengo. Who is Henry B.? perhaps the B is not his initial. maybe I just picked that up through the geneolgy search. I am of the opinion he is the product of James H. and Susanna Hamilton(marriage cert and his birth day sync up well.Perhaps she died in childbirth with his dad later marrying Phoebe Romine. I have not been able to find evidence of them living in the same dwelling and therefore Phoebe rasing Henry. He may have been raised by the Hamiltons. He did note on census forms being born in Kentucky and he did live in Parke County Indiana before emigtrating to Iowa. There are Hamiltons close by on census forms. I find it interesting the Blacketers end up close by in Iowa and in Indiana. Your Sara Blacketer and my Henry have to be close cousins if not half siblings. Thanks for the pictures form the Marengo courthouse! I hope this helps clear you up. I am very confident of all of my information except who Henry’s parents are(there are a lot of James and Johns out there and hardly ever any evidence of middle names It.. I appreciate your efforts, Every little bit of info helps.